Thank you very much. It’s a pleasure to be here today. A large number of highly radioactive isotopes released by the destruction of the Fukushima Daiichi nuclear power plant grossly contaminated the Japanese mainland. Most of these radionuclides had short half lives which meant they would essentially disappear in a matter of days or months. For many of those who were exposed to them there will be major health consequences. However, there were some radioactive elements that will not rapidly disappear. And it is these long-lived radionuclides that will remain to negatively affect the health of all complex life forms that are exposed to them. 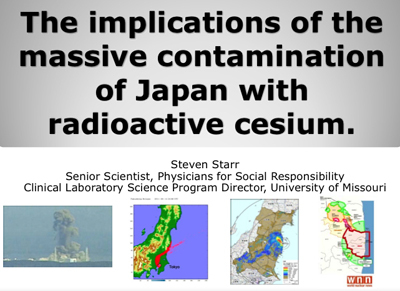 Chief among them is Cesium-137, which has taken on special significance because it is has proven to be the most abundant of the long-lived radionuclides that has remained in the environment following the nuclear disasters at Chernobyl and Fukushima. It has a 30 year radioactive half life which is why it persists in the environment. Scientists now believe that it will be 180 to 320 years before the Cesium-137 around the destroyed Chernobyl reactor actually disappears from the environment. Cesium is water soluble and quickly makes its way into soils and waters. It is in the same atomic family as potassium and it mimics it, acting as a macronutrient. It quickly becomes ubiquitous in contaminated ecosystems. It is distributed by the catastrophic accidents at nuclear power plants because large quantities of volatile radioactive cesium build up inside the fuel rods of nuclear reactors. Thus any accident at a nuclear reactor that causes the fuel rods to rupture, melt, or burn will cause the release of highly radioactive cesium gas. Thus, radioactivity is a term which indicates how many radioactive atoms are disintegrating in a time period. We measure the intensity of radioactivity by the rate of the disintegrations and the energy they produce. 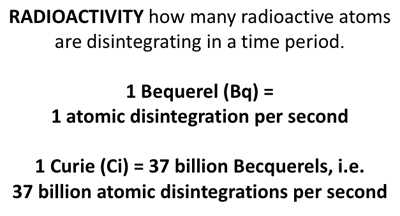 One Becquerel is equal to one atomic disintegration per second. One Curie is defined as that amount of any radioactive material that will decay at a rate of 37 billion disintegrations per second. So one Curie equals 37 billion Becquerels. 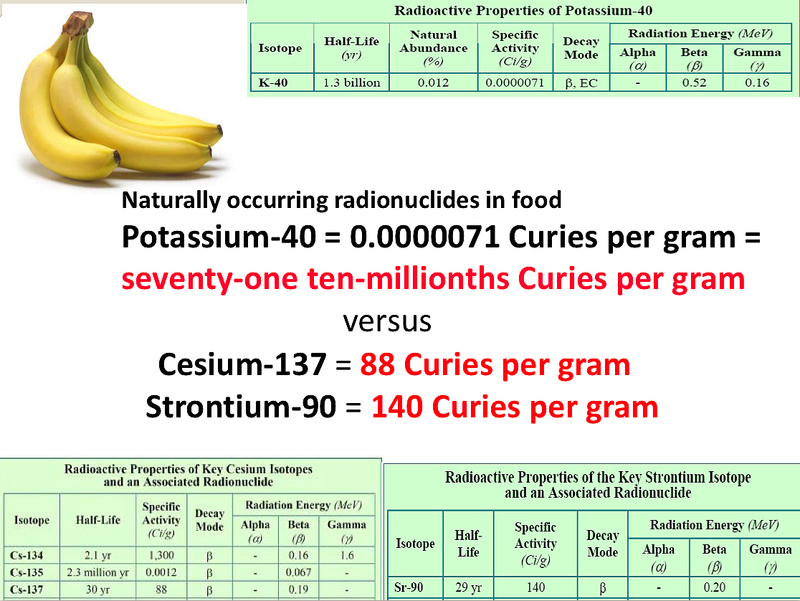 Sometimes these man-made radionuclides are compared to naturally occurring radionuclides, such as Potassium-40, which is always found in bananas and other fruits. However this is a false comparison since naturally occurring radioactive elements are very weakly radioactive. In the lab chart the radioactivity is described as the “specific activity”. Note that Potassium-40 has a specific activity of 71 ten millionths of a Curie per gram. Compare that to the 88 Curies per gram for Cesium-137. This is like comparing a stick of dynamite to an atomic bomb. 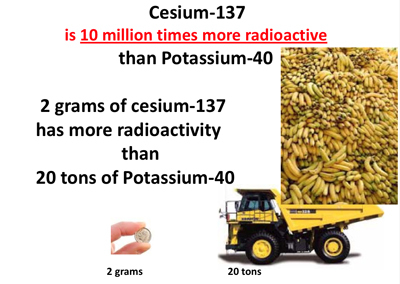 Highly-radioactive fission products such as Cesium-137 and Strontium-90 emit 10 to 20 million times more radiation per unit volume than does Potassium-40. So which one of these would you rather have in your bananas? It is in fact the amount of Cesium-137 deposited per square kilometer of land that defines the degree to which an area is classified as being too radioactive to work or live. One may get an idea of the extreme toxicity of Cesium-137 by considering how little of it is required to make a large area of land uninhabitable. 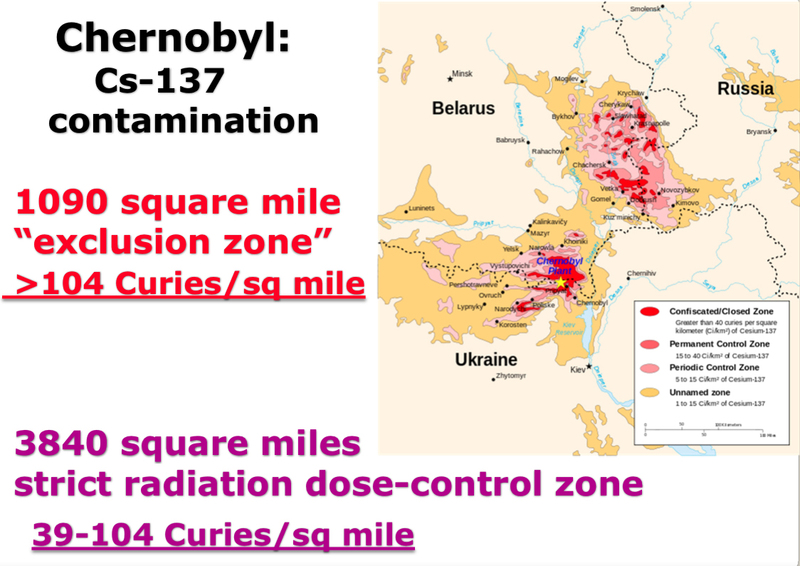 The lands that were grossly contaminated by the destruction of the Chernobyl nuclear power plant are classified by the number of Curies of radiation per square kilometer. 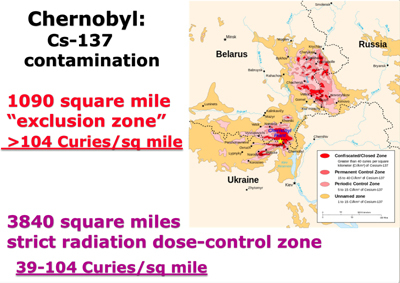 There were 3840 square miles of land contaminated with 15 to 40 Curies of radiation per square kilometer. These lands are considered strict radiation dose-control zones. 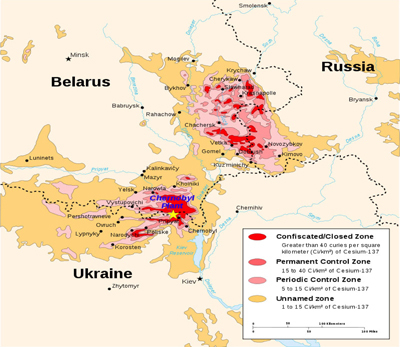 The 1100 square mile uninhabitable exclusion zone that surrounds the destroyed Chernobyl reactor has greater than 40 Curies of radioactivity per square kilometer. For those more familiar with square miles, that would be 104 Curies per square mile. Consider again that one gram of Cesium-137 has 88 Curies of radioactivity. Thus, as little as one third of a gram of Cesium-137, made into microparticles and distributed as a smoke or gas over an area of one square kilometer, will make that square kilometer uninhabitable. 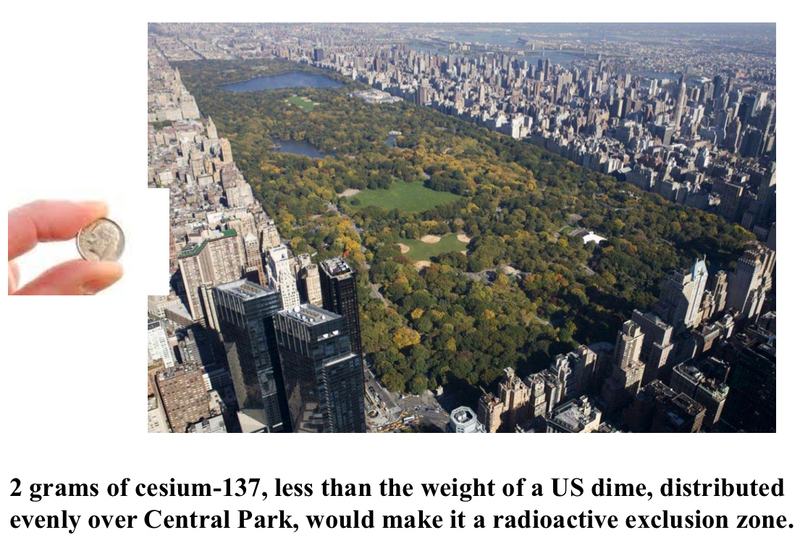 Less than two grams of Cesium-137, a piece smaller than an American dime, if made into microparticles and evenly distributed as a radioactive gas over an area of one square mile, will turn that square mile into an uninhabitable radioactive exclusion zone. Central Park in New York City can be made uninhabitable by 2 grams of microparticles of Cesium-137. Hard to believe, isn’t it? Remember, these nuclear poisons are lethal at the atomic level. 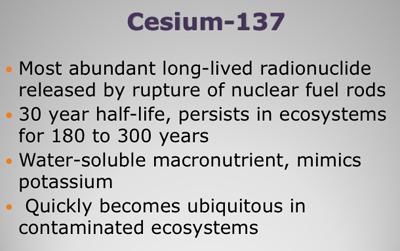 There are as many atoms in one gram of Cesium-137 as there are grains of sand in all the beaches of the world. That’s 1021 atoms—10 to the 21st power. 1480 trillion of them or 1.48 times 10 to the 12th power are disintegrating every second, releasing invisible nuclear energy. So this works out to about one and a half million disintegrations per second per square meter. We can see how this works then. 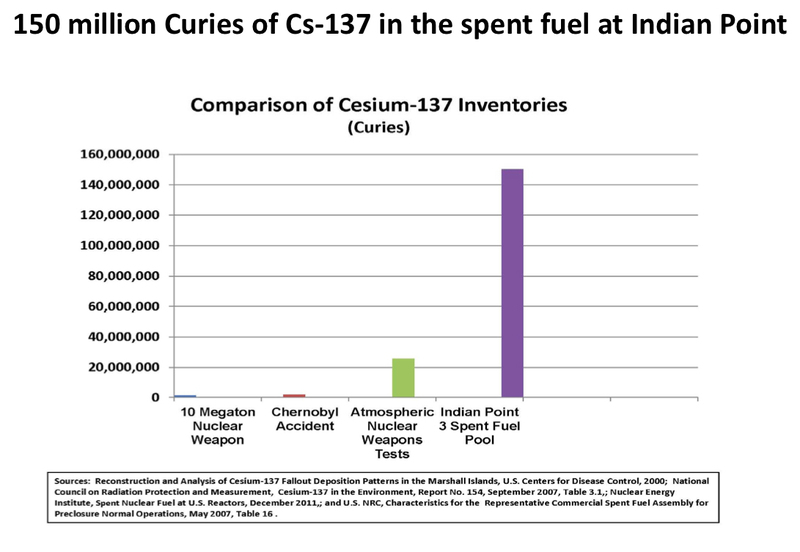 Note the immense inventories of Cesium-137: 150 million Curies that are located in the nearby spent fuel pool at Indian Point Nuclear Power Plant which is about 40 miles from here by road and less than that as the radioactive cloud flies. 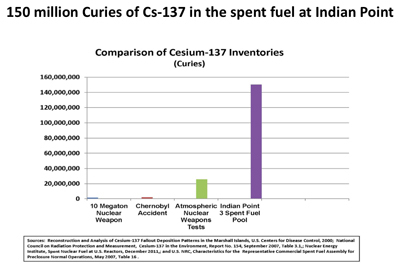 Many of the 104 US commercial nuclear reactors and power plants have more than 100 million Curies of Cesium-137 in their spent fuel pools. This is many times more than in the spent pools at Fukushima. So now that we have some idea of the extreme toxicity of Cesium-137, let’s look at the extent of the contamination of the Japanese mainland. 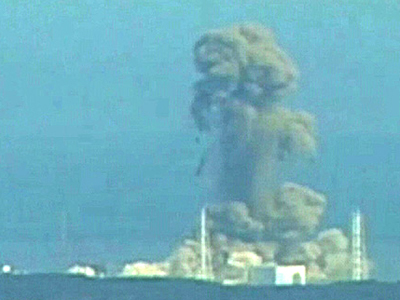 It is now known that the reactors 1, 2, and 3 at Fukushima Daiichi all melted down and melted through the steel reactor vessels within a few days following the earthquake and tsunami of March 11, 2011. This was not made public by either TEPCO or the Japanese government for two months.